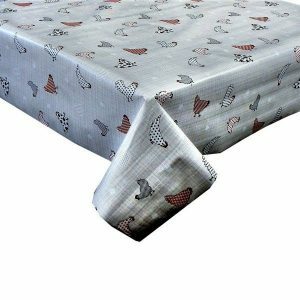 Vinyl tablecloths are like the superfood of the table linen world, good for your kitchen in that they are incredibly easy to care for, wipe clean and durable. They are good for your soul as well as they come in so many gorgeous prints, designs and colours. 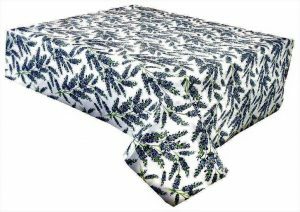 In any house, you are sure to find at least 5 or 6 vinyls tablecloths in a constant rotation, different designs for summer or winter. Or even more specific prints for events and occasions, there is so much variety and choice the possibilities are endless. 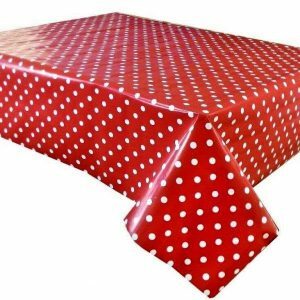 This is our top 5 favourite picks for vinyl tablecloths at the moment. This is perfect for a farmhouse country kitchen feel. Red and Grey hens in a checked and dotty design. The colours are relatively neutral which means it’s easy to match with your existing decoration. It’s a great print for spring/summer but would also be lovely the whole year round, and an ideal print for a family kitchen. This is probably one of the most popular designs we sell. Bright and cheerful polka dots always bring life to any kitchen or dining room. With a vintage feel, it is also well loved by cafes and businesses. This cloth comes with a few different background colours including slate grey or lime green, but we are loving the red at the moment. 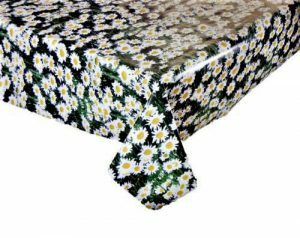 Another floral theme for summer inspiration is this daisies cloth. This reminds us of days sat in the park, making daisy chains in the summer sun, with long balmy evenings and an ice cream or two. This print is green grass with a daisy floral scene and is perfect for both inside and outside the house. For alfresco eating it’s a perfect print and a brilliant excuse to get the BBQ out. This is a vinyl for the cool people of the world, or perfect for bars/cafes etc. 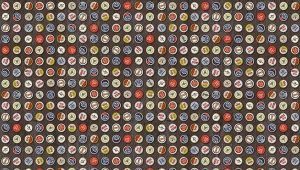 Varieties of beer bottle caps on a tabletop are incredibly stylish, funky and on trend. Modern and retro all at the same time, it will definitely be the talking point of your kitchen and is perfect for entertaining. All the vinyl tablecloths are textile backed and PVC coated, so just wipe clean. They will protect your table from messes and spills so are ideal for everyday use, and can be easily trimmed down to size for any shaped table. They are sold in half metres 137cm (54 inches wide) for £3.00 per half a metre. Just click the amount you require in the quantity box and feel free to contact us if you have any questions.